Pulling in late at Moraine Lake after the long drive around from the Bugaboos, I threw food, axe, and crampons in my pack before turning in parked near a few kindred souls in the mostly-deserted parking lot. Planning to climb Deltaform, then continue along the Ten Peaks crest if I felt like it, I started up the trail around 6:30 AM, only to be blocked by a sandwich board announcing a mandatory bear closure. In the whole area around the lake, people were required, on pain of $500 fine and/or jail time, to travel in groups of four or more. I stared dumbly at the sign for awhile, unable to decide what to do. There was no way I could plead ignorance, but what were my odds of being caught? What were my chances of escaping with a warning? And would a Canadian park ranger have some way to extract the fine from an American carrying no ID? 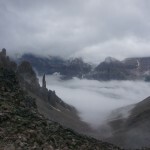 While pondering such imponderables, I was passed by Mark, Roman, and Gennady, two Poles and a Russian down from Edmonton for a hike up Temple Mountain, an impressive peak with a moderate scramble route on its dry southwest side. 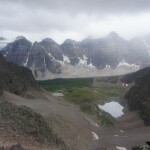 Forming an impromptu 4-person international alliance, we started up the trail to Sentinel Pass. Though we saw no rangers, we were passed by a lone man dressed for a dayhike. We re-caught him at the pass, where he introduced himself as Alex, originally from Ukraine. Equipped with bottled water and energy bars from a hotel mini-bar or gas station, he was debating whether or not to continue up Temple. The five of us started up the obvious use trail below the pinnacle marking the half-way point of the climb, Mark and Gennady falling behind in conversation while Roman, Alex and I slowly drifted ahead. 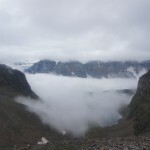 Having been sandwiched between two cloud layers at the pass, we soon climbed into the upper one, choosing our path based on what seemed locally optimal. The single obvious trail split and faded near the first gray rock band, and we followed one branch of sporadic cairns and orange tape right along its base for awhile before scrambling through a short 3rd class gap. 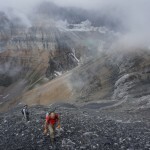 Above this gap, we were confronted by acres of hideous black scree and no cairns or trail. As the most experience of the group, I ended up in the lead on a painful ascending traverse to the right, where another bit of scrambling got us through a second gray rock band. We were apparently off-route, and though I took the loose scrambling in stride, I felt slightly guilty for involving the other two. Our situation became clear when the clouds briefly cleared: the correct (and now crowded) route had headed straight up rather than traversing along the first gray band, and we were now far from the standard southwest ridge, closer to the south ridge. 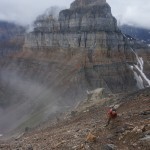 So be it: I found a moderate line up to the south ridge, where I hoped the scree would be flatter and tamer. Reaching the ridge after a final, short rock step, I was relieved to find loose but easier class 2 scree. 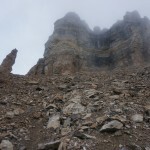 From a picture on Roman’s printed route description, it looked like it would be moderate scrambling from here to the summit. This was unfortunately not quite true: some choss-towers on the crest forced us to side-hill to the west, and there was a steeper 3rd class scramble to the final summit ridge. Finishing this pitch, I was confronted by two shelters and an embarrassingly-obvious trail. I waited for Roman and Alex, then the three of us continued to the summit. 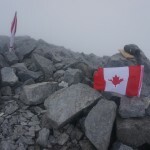 The view was more or less the same as elsewhere on the peak — gray clouds and gray scree — though here there was a Canadian flag, a red-and-white umbrella, and the abrupt start of the summit ice-cap to the north. Putting on all of my meager clothing, I huddled on the summit for food and photos, impressed that Alex seemed comfortable in just a button-down shirt and sun hat. The crowd began to arrive as we prepared to head down, and we talked briefly, trying to figure out what had happened to Mark and Gennady. 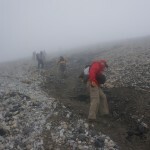 After passing more hikers on the way down the obvious trail, we eventually met them, and learned that their earlier delay had saved them some effort, as some other hikers had directed them to the proper path. 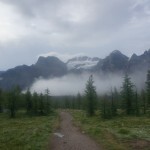 Getting a bit ahead of my two companions, my natural selfish impatience took over, and I left them to find their own way down the trail, quickly scrambling down to the pass and jogging the trail. I thought of slipping in with a group for protection from the rangers (and bears, I suppose), but others were freely traveling in groups of fewer than four, so I continued alone, reaching the trailhead in time to find a few overpriced supplies and some terrible internet in Lake Louise before heading north on the Icefield Parkway.